A friend of mine is an excavator and ask if I was available to assist him on a construction site for a few weeks. While digging at the site I found a Model T fender brace, a Model T wish bone, and a leaf spring for a Model T. I ask him to keep digging as we may find the whole car. None of the parts are useable but I brought them home just the same to hang in the garage as conversation pieces. Who says retirement has to be boring! Keep digging, You might find that mason jar full of gold coins! Hopefully you will find this! A few years ago, the electric utility put a high voltage line under the main street of our town. 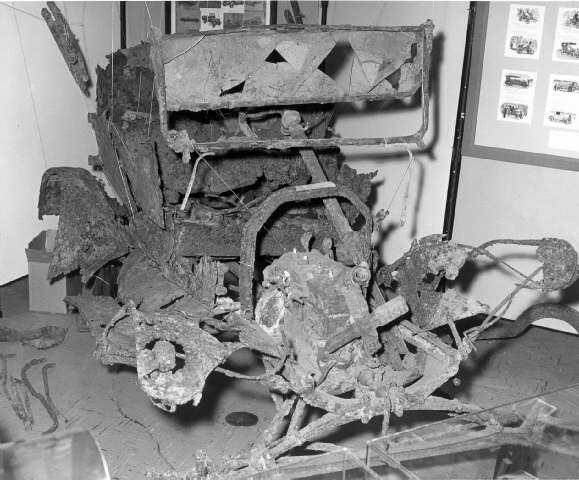 While excavating, they found one half of the rear axle housing of a 26-27 and one rear radius rod. They also found an axle from something much larger than a Model T. They found an old wood wrapped with steel and sealed with tar water pipe about 10 inch diameter. These items are now at our historical society museum as "yard art"
When they demolished an old fuel drum storage in our main street, they had to jack-hammer the concrete floor out. The whole thing had been re-inforced with hood irons, most brand new. The premises had once been a saddlery and canvas goods factory. I knew that they did modification work for the local Ford dealer when tourers were cut down into buckboards. Looks like all the stock left over was put to use after all. In the 70s I went to a old car yard in Fort Union Va. It was full of cars mostly in the 40s then. The owner told me there was an old vertical gold mine on the property and early during ww2 , the government told him to re cycle the metal . For some reason he told me he pushed all his Ts down the shaft and that was the reason none were left on the property. He has since died and the property was cleared. Interesting person to talk to. I know where two T's are said to be buried on a friends family farm. He told me that grandma was tired of all the junks sitting around the farm so grandpa hauled all the junk back to the swampy hole and buried it all. I have the windshield frame from one of the Ts. He found it in the rafters of the milk house. My grandfather wanted to sell a 1914 Model T but time after time, he could not get the price he was asking. Frustrated, he chopped the spokes out of the wheels with an axe, and pushed it into the backfill hole of a foundation he was digging. Still there. was going into the fuel oil/kerosene business. the machine was digging it struck a large object. a speedster. I wanted them to save it but nope, it went back into the hole and the tank went in on top. I as far as I know, it's still there. A buried 1956 Chevy makes a good septic tank. When I was working for the phone company in the S.F. Bay Area, my buddy and I found the frames of TWO model T's embedded in a creek bank, just the rears sticking out. They had evidently been put there as fill many years ago. We broke out shovels and dug back into the bank, exposing engine blocks in both. Did we get them out? Nope....lunch break was over. The equipment i had was very large and so most of my digging was for farmers land clearing/fence rows/cleaning ditches/burying houses and barns.Once i did bury parts of a T snow mobile and i have found other model T parts in stone piles.I never found any bones or bodies.Bud. I cant say that Bud. We found a family cemetery digging a foundation for a new house years ago. Shut the job down for a few weeks while IU poked around and recovered the bones that were uncovered. They thought early 1800's was the time period. No markers but there were some large stones close by on the edge of the woods. Nothing uncommon in farm country . My friend's place suffered subsidence and they were moved out to a rented apartment while the insurance paid for the place to be underpinned. When they dug out the living room floor, they found an entire Austin 7. There is a roller skating rink not too far from here that was built on the site of an old auto wrecking yard full of Ts and As. Since the site sloped away from the road, rather than move the cars, they were used as fill for the new building.